March Madness is always full of excitement, no matter who's headed to the Big Dance. Every year March Madness breeds a whole new batch of NCAA tournament stars who will add to their name to the "one shining moment" legacy forever. With that in mind, why not take a look back at some the best March Madness players who came out of nowhere to lead their teams to tournament glory. Charles's buzzer-beater dunk propelled NC State to the NCAA Championship over the heavily-favored Houston Cougars in 1983 and is still one of the most iconic moments in the history of March Madness. Charles was tragically killed driving a bus for the Elite Coach charter company in 2011. Bryce Drew is responsible for what might be the greatest "Cinderella shot' in the history of the NCAA tournament. His last second three pointer helped the 13th seed Valparaiso Crusaders defeat Ole Miss in 1998 and is such an iconic moment that it even has its own Wikipedia entry. God was definitely on Providence's side in the 1997 tournament as God Shammgod helped lead the No. 10 seed Friars to an improbable Elite 8 appearance. God also proved that it basically takes a god to beat Duke in the NCAA tournament. Shammgod also still has arguably the coolest name in the history of sports. The West Virginia big man helped lead the Mountaineers to an appearance in the 2005 Elite Eight and the 2006 Sweet 16, thanks to his silky-smooth outside shooting stroke. 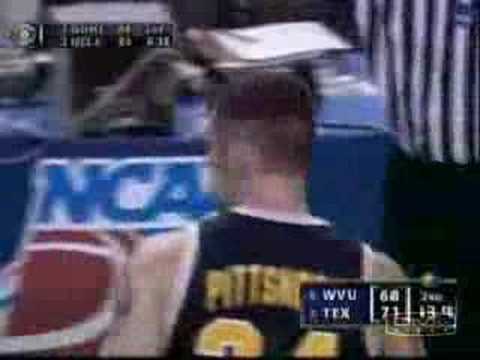 "You've been Pittsnogled" became the school's rallying cry and is still probably one of the worst catchphrases in the history of college basketball.